One of my favorite things about living on the West Coast for co-op is the sheer amount of opportunities to travel. I’ve been lucky enough to visit many places up and down the coast, one of my favorites being Portland, Oregon. Portland provided me some of the East Coast charm I’ve been missing, without the hassle of a red eye flight. While I was only able to spend a short weekend in Portland, I was able to see many interesting attractions. In fact, I enjoyed my trip so much I’m planning on returning in June, hopefully to see even more of the city. Below are some of my favorite Portland attractions I saw during my time, a list I’m excited to have grow during my upcoming trip. It should come as no shock that I love reading, especially considering my reoccurring ‘Business Book Club‘ series. 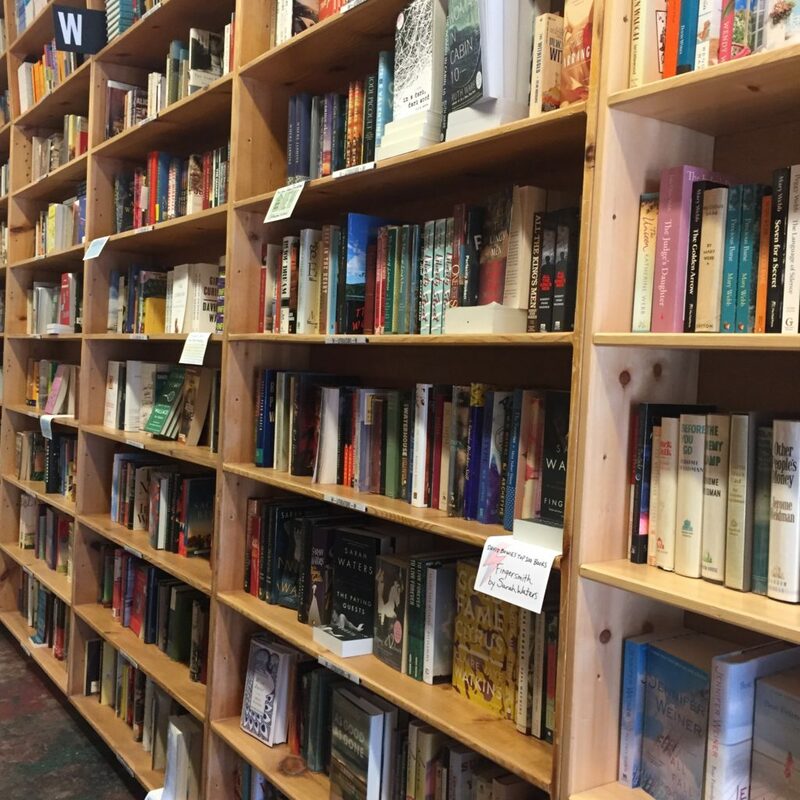 So when I searched for ‘Top Portland Attractions’ and found Powell’s City of Books, a bookstore a city block long that CNN rated as one of the world’s coolest bookstores, I knew that I didn’t have to worry how I was going to occupy my time. Powell’s was amazing. Over the course of four hours, I was able to explore each of the nine rooms, color coordinated to different genres, including a section for rare books. I mostly stayed in the Blue Room, literature, especially since a kind salesperson gave me a free bookmark listing recommendations of fictional biographies, one of my favorite genres. Something that I particularly liked about Powell’s was the level of personability throughout the store, even beyond the kind staff members who were ready to help me find anything and everything I needed. When you walk down the shelves of books, something that stands out is the sheer number of tags hanging off. These highlight everything under the sun, including ‘Staff Picks,’ books written by women of color, local authors, and quotes from popular reviews. I loved these, and definitely thought it made me stop to consider books I might have otherwise passed. As I mentioned in my last blog on my favorite New Orleans attractions, I love markets. Therefore, it only seems fitting that I visit Portland’s weekly market, a market running since 1974. A completely free open air market right on the water, it is the perfect place to spend a warm afternoon. I love getting the opportunity to talk to artists about their work, and this market definitely gave me the chance to hear stories about the local artists’ inspirations and works. 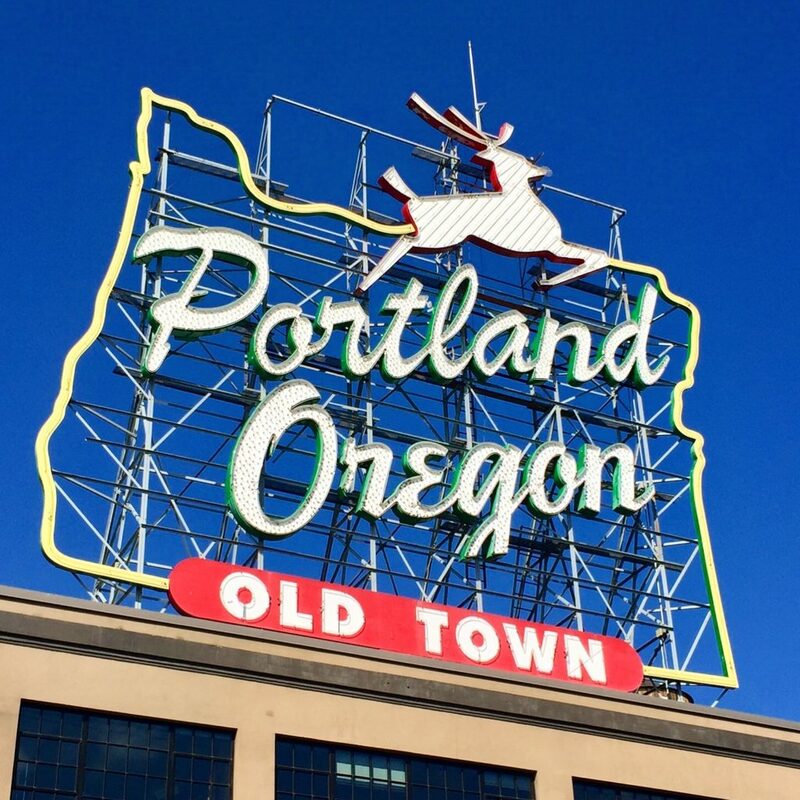 The art market is also right near the Historic White Stag Sign, one of the most famous parts of Portland’s skyline. While I visited in April and was able to see the sign in its usual state, for those visiting during the winter holiday seasons, the stag’s nose is lit up red to represent Rudolph the reindeer. If you are looking for even more art, Portland has got you covered. The Pearl District, located between Interstate 405 and NW Broadway, features dozens of art galleries. I like art galleries for a multitude of reasons. First and foremost, I enjoy being able to see a collection of work from the same artist, as it gives me the opportunity to better understand the type of work and messages he or she is trying convey. As a younger person galleries are also great for additional reasons. Rarely does anyone expect you to be able to purchase anything, so you are free to wander around uninterrupted. If you decide to ask questions, however, people are generally excited to have someone new and interested in what they have to say. And finally, art galleries are usually free, my favorite cost of admittance. Portland’s art galleries were cool and featured incredible art. 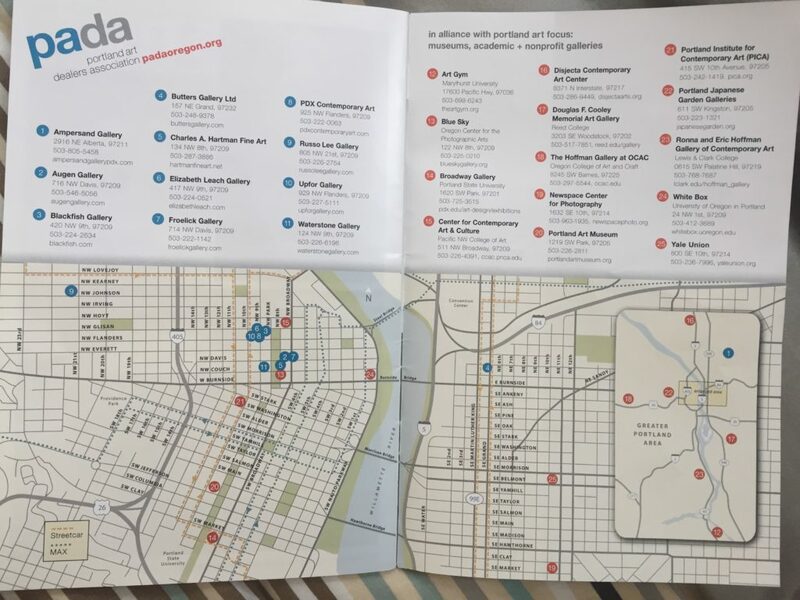 The first I visited, and potentially my favorite, Blue Sky Gallery, provided me a map that highlighted some of the other galleries within the Pearl District, and in one afternoon I was able to visit nearly all of them. My Saturday in Portland was ideal, with my time was spent between art galleries, an art market, and a bookstore. The second day I was in Portland I rented a car, giving me the opportunity to explore outside the city limits. 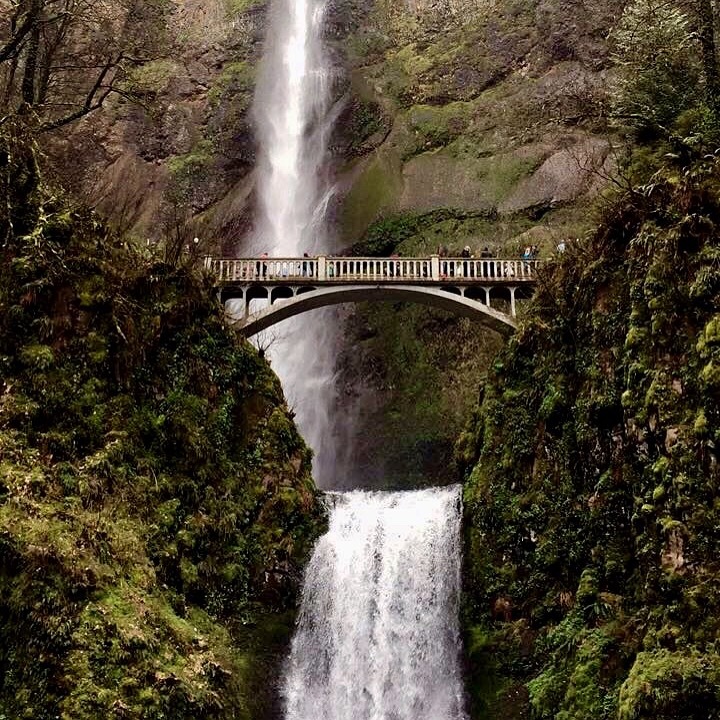 One of my friends had suggested that I see Multnomah Falls and the subsequent natural wonders on the road to it. This part of my visit was one of the best parts by far. I had expected the ride to be beautiful, but I was continuously surprised by just how magnificent the view was. I don’t think I’ve ever been on a highway with a more stunning view. The right side of the road featured hills and waterfalls, on the left the river, and in front of me the view of Mt. Hood. I continuously stopped my car to pull over and explore. Although the most famous of the stops was Multnomah Falls, there are many waterfalls on the way that are equally as stunning. I was surprised by the sheer amount of waterfalls, as well as a number of locations you could casually begin a scenic hike. Even on the river-facing side of the highway, there were times when I pulled over to take pictures of the view. People not looking for a miles-long hike can also enjoy the beauty the Historic Columbia River Highway has to offer. Part of the reason I wanted to see Portland during the spring was to see the tulips at Wooden Shoe Tulip Farm. 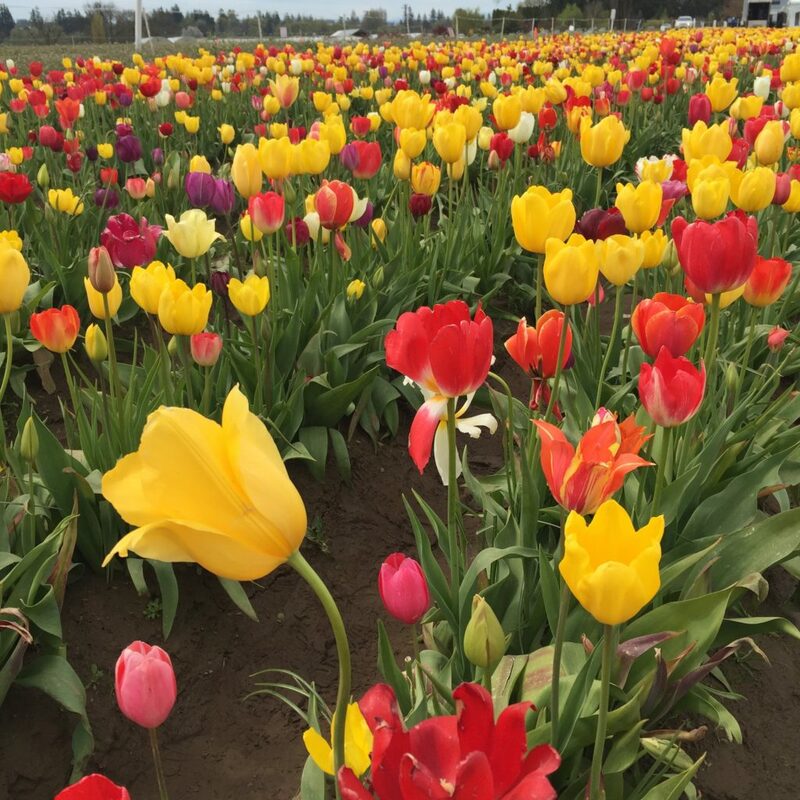 Located about an hour south of the city center, Wooden Shoe Tulip Farm has over 40 acres of tulips, framed against the scenic Mt. Hood. I have mentioned in a previous travel post about my desire to see the Netherland’s tulip festival, and after hearing that there was something similar (albeit on a smaller scale) I figured I had to go. It was as beautiful as I had hoped for. The sheer amount of colors in a single type of flower was astonishing, as I didn’t even realize how many colors tulips came. Being able to walk through the rows of flowers was beautiful and worth the trip. There were also a lot of activities at the farm including wine tasting, wooden shoe making, and carnival rides which made the day even more enjoyable. It was crowded, but I went on Easter Sunday, something I bet contributed to the number of people visiting. If visiting Portland during spring and want to see some beautiful flowers, definitely head south to check out the tulips. I loved Portland and what the surrounding parts of Oregon had to offer immensely. It has been my favorite trip on the West Coast so far, so much so I’m planning on returning in June to see more! This entry was posted in North America, Travel and tagged oregon, portland, top-attractions, travel. Bookmark the permalink.